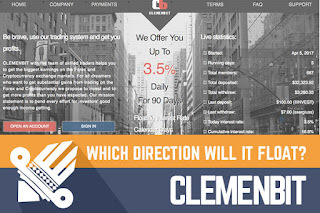 DavidNews HYIP blog - News & Reviews: CLEMENBIT - Which direction will it float? CLEMENBIT - Which direction will it float? It has been a great weekend for me and I hope it was the same for you. However, it’s time to get back to HYIP’s and share my thoughts about the new and promising programs and as usually, do some extra research, to unwrap the information available on program websites. So, let’s get back to serious things. Today I’m reviewing a program called CLEMENBIT, which joined Golden Stage listing on DavidNews.com on the 8th of April. The program has been online already for 5 days and I have reinvested in it $400. Therefore, I will let you know about the progress of this program. The homework is done well - company name, registration number, and address match company registration entry on Companies House website and CLEMENBIT website. It’s not a guarantee of a promising HYIP, but it’s just one of the factors I’m paying attention to due to many programs showing fake details on their website. Incorporated on December 13, 2016 and is providing financial management (nature of business indicated in Companies House register), which is like most of the HYIP’s with company registration data available online. How much effort did owners put on their website? I would say that first impression is too much information on the home page. Of course, the most important thing that first time visitor can find the most important information – interest rate, length, and other details. I must admit it’s very handy to find the most important facts here, but the overall layout is very heavy and contains too many visual elements and text. For sure, it’s a personal preference and it doesn’t mean you will feel the same. Design and script seem custom-made, which for sure is another important factor for me. However, there are also plenty of programs with paid scripts, which look much better. I mean, in many cases the custom-made website is extra effort for admin. As usually, it doesn’t mean that such programs are more safe or reliable. For a while I haven’t seen such down to the ground approach on social media. It’s not a praise, but most of the programs purchase existing social media accounts or a certain amount of likes. There is no other explanation for having 5 days old account with a few posts and several hundreds of followers. Here we see Facebook account with 2 posts and 10 likes and Twitter account with 4 tweets and 3 followers, which seem quite organic for 5 days old program. For sure, any HYIP owner wants to spread the word, but a fake boost for new social media profiles look ugly and is something that must be considered. I did check some discussions on forums and didn’t notice anything unusual for a new program. Folks are adding posts and showing a number of their deposits, which doesn’t say much about the program. The most important is when it stops paying withdrawals. CLEMENBIT is another program accepting Payza payment method. In order to avoid repetition, just want to remind that it’s not a very popular payment method due to complex verification method. In the meanwhile, CLEMENBIT is also accepting PerfectMoney, Payeer, BitCoin, ADVCash, OkPay, Neteller. As you might see, many options for different tastes. In fact, I don’t remember writing a review for a program with so many payment options in the last couple of weeks. However, I might have a bad memory. Of course, payment methods are just another factor, which is important for me but has no impact on the longevity of the program. Finally, I would like to take a quick view on their investment plan. Yes, it wasn’t a typo – this is a program with just one investment plan, which is much easier to understand for many potential investors. However, keep in mind that CLEMENBIT is offering a floating interest rate up to 3.5%. In fact, it can be also 2.1%, which is mentioned as a daily minimum. Another important thing to keep in mind is that your deposit is included in payments. Basically, you should calculate when your deposit has been returned and a number of days when your deposit will start making more money. As usually, daily profit is important for me. Due to floating rate (2.1-3.5) I choose average, which is 2.8. In fact, you can check their website, in order to see what’s the interest today and what it was in previous days. Just a quick calculation to show you what can we make here if it will not end in the next couple of days. For example, $200 deposit will start generating income only after 36 days. Let’s say you decide to keep the deposit in the program for 50 days, which will result in $80 revenue from 200, which seems fine. Of course, 50 day is a lot and many things can happen. Some might say my calculations are not 100% right due to the floating rate because if you calculate average rate it is 2.8%. Yes, but I’m more to the ground since the program is online only few days and you don’t know which way it will go in next couple of days of weeks. 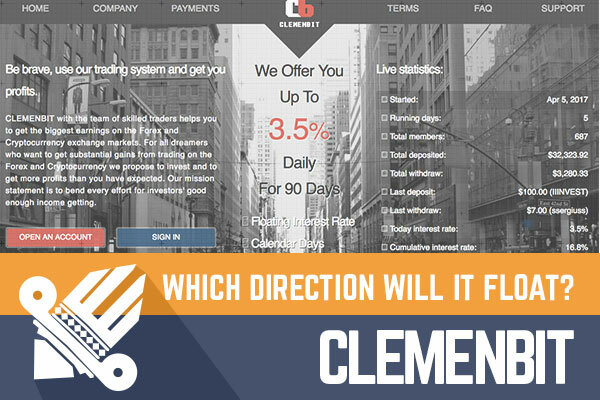 As can be seen, there are quite a few positive facts about the CLEMENBIT, which should be considered, but they are not a guarantee for return of your deposit due to the unpredictable nature of any HYIP. The program is trying to attract long-term investors, which is totally fine and it’s very good that initial deposit is included in payments, not returned at the end. Don’t be too optimistic about the floating interest rate and just stick to the average. I’m sure that only administrator knows when and why the interest rate will be changing. Remember, all HYIP’s are highly risky and that you are only responsible for your investments. However, if you decide to make any investments, don’t invest more than you can afford to lose! Investment plans: Variable 2.1% up to 3.5% daily return for 90 calendar days, initial deposit included in the payments.